Kew Garden in London - a green oasis on the outskirts of London. 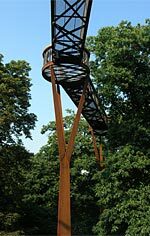 For those of you who love gardens and if you like to get a bit out from downtown London - we recommend a trip to Kew Gardens. 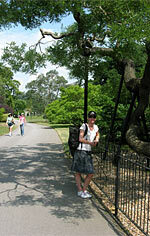 There are lovely walking paths where you pass by old houses, lakes, Palm House and much more. This fantastic park was originally two large fields (Key Estate and Richmond Estate), these two later became the Royal Botanic Garden. 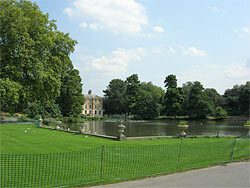 The name Royal park comes from back in the 1700s when the park was owned by King George II and his family. The area was owned until 1840 by the royal family then the state took over the ownership. The park has been shaped over the years and you go through different areas with trees, buildings, large grassy areas, lakes, museums and houses, etc. In 2009, the park was celebrating 250 years. Over the years several different architects worked on the park, among others, Lord Bute and the architect William Chambers, which is famous for among others Orangery, Pagoda, and ruined Arch. Make a visit to this wonderful park. 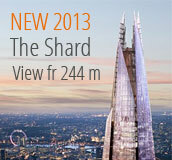 The park is approximately 30 minutes from central London by subway and commuter train. 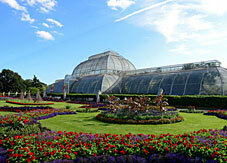 Discover 131 acres of gardens, 3 art galleries, Xstrata Treetop Walkway (Kew Palace), Palm House and much more. Tip: Please take a boat to the Park and get home via the metro. Open to the public during April - late September and during Christmas. The park is sponsored among others by the Department for Environment Food and Rural Affairs. Visitors also pay admission. The park has about 700 employees and are on the UNESCO World Heritage List. In the park you will find libraries, Palm House, the gallery of paintings, a walk up among the trees and of course the various gardens for you to walk around in: The Rose Garden, Azalea Garden, Bamboo Garden, The Lilac Garden, The Bonsai Collection and The Rhodedendron Garden etc. If you walk around the park, you will eventually get to the Chinese high tower - Pagoda - built 1762. It was actually built by a man who was born in Gothenburg - William Chambers. The tower is 50 meters high. 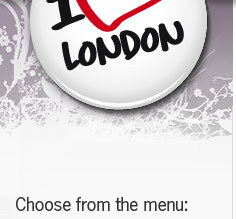 In the Summer, we recommend you to take a boat from Westminster Pier and get off at Kew Garden. On the boat they sell beer and snacks . If you go by subway from London's center - take "the District Line train" with destination "Richmond" that stops at Kew Gardens station. 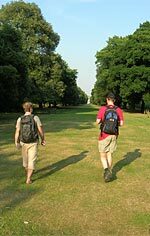 One time in summer time we took the boat out to Kew Gardens and when leaving London behind us, you get both a stunning view of many of London's sights and the feeling of being in a small town. Kew Garden has lovely big green lawns, and we can really recommend bringing your own food and a blanket. After that you study the trees from "underneath" in a lying position. It is not allowed to swim in lakes (which we would have liked to do during our visit on a hot summer day). 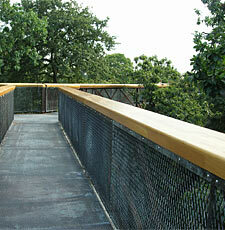 "Walkway among the forest tops"
Inside Kew Gardens you will find a walk way up in the trees. Here you get a sense of what it is like to walk up there. At Christmas a large lake is flushed where you can go ice skating and in the Summer outdoor concerts are held here, among others.